The program will have an initial organizational meeting in February 7, 2019, 7:00 PM at the Webster Groves Arena. On-Ice sessions will take place on Thursdays & Sundays, 10:30 PM at the Webster Groves arena. $25 Deposit - reserves a place for you on a team roster. Be sure to let us know of any friends that want to play. Payment 2 - $187. This will be due at the initial beginner meeting, which is an off-ice meeting where you hear about the program, meet your teammates & meet members of the League staff. Payment 3 - $187. Paid 30 days later, for a total of $399.00. The playing fee includes 16 ice sessions, instructor(s), referees, scorekeepers, and ice times..
What's not included - Ice skates, protective equipment, school jersey & your formal team jersey. At the organizational meeting we will let you know the team name, uniform, and colors. You'll also order your jersey & pick a jersey number at the meeting. You'll love it! The jerseys are very nice and you'll love wearing the pro-calibre jersey with pride. 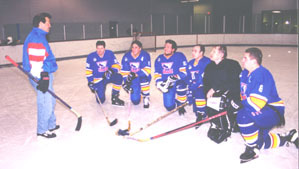 Started back in 1980, the then "National Novice Hockey League," or NNHL, took a group of adults who had never really skated before, and started the very first school for the adult beginner. Fast forward 39 years, and you’ve got Hockey North America– the hockey league that has taught tens of thousands of people to play hockey and to this day, continues to innovate with features and service in the adult hockey market that are now the most widely copied concepts in arena & league management today. But back then, ice hockey was far from popular. Fighting was commonplace, as was brutal body checking. And Heaven help you if you were an adult that wanted to learn to play. In a way, taking the ice for the first time against accomplished adults redefined the “school of hard knocks.” Forget that. 2. Keep the playing environment a safe one, understanding that there’s a huge difference in paying to play– and being paid to play. We might be crushing a few dreams, but to date no one in 39 years of HNA hockey has ever “turned pro” at any level of competitive hockey. So we’ll take away the mystery now. Don’t make any plans on quitting your job to go play hockey for a living. Instead, our focus isn’t winning a hockey game, it’s more about creating an environment where no one knows ahead of time who’s going to win. To us, the program operators, not knowing who's going to win and watching as the season plays itself out is what makes the league so much fun, but also interesting and challenging to continue to provide that type of playing environment season after season to the League's members. The first thing is to understand is that hockey is not an inexpensive sport, and getting less so every year. Especially your very first year, since you’re buying all new gear and learning to skate, you need to know that you’ll be spending some money (don’t worry, the stuff you’re getting will last a very long time, as long as you take care of it). Once you get started and stay on the same team, it’s just league fees. Second, is to give the HNA League Office a call at 800-4-HOCKEY (800-446-2539) and sign up to play. A small $25 deposit holds a roster spot for you for the next school session. Sixth, when you get your email notice, be sure you attend the organizational meeting for the beginner program. This meeting is important to attend. You’ll meet your teammates, get your school schedule, find out your team name and colors, meet members of local administration, and have all your questions about hockey and the League answered. We’ll also have you fill out some forms and pay some money as well – it’s all part of becoming a hockey player. Seventh, take what you learn in the school and practice. Either use inline skates or head out to a public skating session to start building those leg muscles and gaining your balance. Think just standing up on skates is tricky? Soon you’ll be doing full-fledged hockey stops, skating backwards and actually doing more with your stick than just holding yourself up. Part of the process of getting to that point, however, is practicing outside of the hockey school. Ice hockey is a true skill sport, and the more you practice the faster you'll get the hang of it. And finally, when the times comes, elect a captain that does more than put the puck in the net. Recreational hockey really isn’t about the bravado of who can score more goals. It’s getting a group of people together as a team, and having them understand each other and stay organized enough to get things done both on, and off, the ice. A good recreational captain is one that is available by phone during the day, has an email address that is checked fairly regularly, and understands the role the captain plays is as a conduit for information between the team and the League. No question a captain needs to be a leader on the ice, but the team is made or broken, off the ice.